This Demonology Warlock guide is primarily intended for use at level 90 in PvE environments and Raids. However, the some of the principals will still apply during the leveling process, so if you’re looking for advice on quickly leveling your Warlock, take a look at our Warlock Leveling Guide. Dark Regeneration is an on demand heal that also increases the effectiveness of healing for a short while after, not a bad option. All three survivability mechanics are viable choices with perhaps Dark Bargain being the most interesting of the three in that it provides the most powerful survivability mechanic, but on the longest cooldown. Pick whichever your find most useful in a specific encounter. Blood Horror seems rather useless for most encounters, or rather all of them. Grimoire of Service provides the highest damage at this time. Grimoire of Sacrifice provides decent damage, but is sub-optimal. Kil’Jaeden’s Cunning is ideal for movement heavy encounters. Minor glyphs are all cosmetic, pick any three that you like the looks of. Int is far and away your best stat, compared to Mastery/Crit/Haste, to the point where youi might want to skip gem socket bonuses and just gem for Int. Your pet of choice should always be Felguard or Wrathguard if you chose the Grimoire of Supremacy talent. Demonology Warlocks use Demonic Fury to power their Demon Form and its various abilities in similar fashion to the Soul Shards of Affliction or Burning Embers of Destruction Warlocks. Your rotation revolves around generating Demonic Fury and then expending it for maximum damage. Apply and maintain Corruption on your target at all times. Hand of Gul’Dan operates on a charge system and should be used whenever the spell is available and the target does not have the Shadowflame debuff. Cast Soul Fire whenever Molten Core procs. If none of the above are available use Shadow Bolt. Once you’ve pooled Demonic Fury activate Metamorphosis. This should be done immediately after using Hand of Gul’Dan, refreshing Corruption and, if you have the Glyph, using Imp Swarm to generate the maximum amount of Demonic Fury possible prior to activating Metamorphosis. Throughout Metamorphosis you should seek to keep Doom active on your target. Avoid using Soul Fire when Molten Core procs unless you have 2 stacks of the buff in which case you should use it once to avoid wasting a stack of Molten Core. When facing multiple targets apply Corruption to all targets while, (if facing 2 or 3 enemies,) maintaining your single target rotation or, if facing 4 or more enemies, using Hellfire instead. While in Metamorphosis use Doom on all targets. If you have a Felguard/ Wrathguard active then use Felstorm. Dark Soul: Knowledge increases your mastery by 30% for 20 seconds. Use it on cooldown, ideally lining it up for when you can stay in Demon Form/ Metamorphosis for as long as possible. Summon Infernal and Summon Doomguard share a cooldown and therefore you will have to make a choice between the two depending on the encounter. The Infernal is superior for AoE encounters while the Doomguard is best used for single target DPS. Both last for 45 seconds with a cooldown of 10 minutes meaning it’s unlikely that you’ll be able to use them more than once or maybe twice at best during a single encounter. Note that Grimoire of Supremacy upgrades the Infernal into Summon Abyssal and the Doomguard into Summon Terrorguard. Life Tap is used to regain mana, however as it costs life both the passive effect of Grimoire of Sacrifice being active and a number of other survivability cooldowns can be used to counter the loss of health necessary to refill your mana pool. Soul Shatter reduces all threat by 90% on a 2 minute cooldown. Soul Leech makes your Shadow Bolt and Soul Fire spells heal you for 10% of the damage dealt. Harvest Life drains life from all enemies within 15 yards. Dark Regeneration instantly restores 30% of you and your pet’s maximum health and increases all healing received by 25% for 12 seconds. This ability has a 2 minute cooldown. While Grimoire of Sacrifice is active you regain 2% of your maximum health every 5 seconds, and the damage of Shadow Bolt, Soul Fire, Hand of Gul’Dan, Metamorphosis Melee, Wild Imps and Fel Flame is increased by 30%. Grimoire of Supremacy upgrades your demons into an improved form, increasing their damage by 20% and granting them improved versions of their abilities. Your Warlock bonus adds to any Int gem bonuses, making them worth 5% more Int. That bonus does not add to other stats. If you want to buy the best enchants, fund all of your alts, donate to the guild, etc., but don’t have the cash, then see what the Tycoon Addon can do about about improving that situation. Helm enchants are gone as of Mists of Pandaria, shoulder enchants are all from the Inscription profession. As with gems your Nethermancy adds to any Int bonuses. Gems with secondary stats (Haste, etc.,) have double the value of those with primary stats (Int, etc.) Depending on how the exact stat values work out this may put Blacksmithing ahead of the others. Ok, there aren’t any race choices that are specifically good for Demonology, other than Orcs, so go Undead. If nothing else they look the part. Best Alliance? Gnome, for the Mana and escape; Human for the escape. Orc– Big, green, massive… Maybe they should use a big axe instead of a wand? Blood Fury increases melee and spell damage, the latter of which suits Warlocks just fine. Drop this into a macro with your opener. The decreased stun duration is nice for PvP and might have some rare PvE utility. Touch of the Grave drains life and heals you for the same amount, which will have occasional small utility. Blood Elf– Can a magically addicted elf make a good Warlock? What do you think? Arcane Torrent is a nice spell interrupt with some PvP utility, but since it’s melee range and you don’t want to be in melee range… Well ok, they look good. A truly devastating Warlock Ability. Really. Hmmm… Increased casting speed, when Berserk, is very nice. Goblins – Hmmm… they sell everything else, why not their souls? They’d probably make a great deal on it. Goblins can Rocket Launch forward, which might be a nice escape ability. Increased Haste is nice in end-game raiding since Haste is a good stat for you. Human – A decent Warlock race for PvP, nothing much for PvE. Dwarf – Various Dwarf factions have put away their differences and joined forces after the Cataclysm and that’s where the Warlocks are infiltrating…er… coming from. This probably explains the things crawling around in the shadows of Ironforge. An increased crit chance is nice, but Crit isn’t a great stat for you. Note that if you cold be a Pandaren you would get twice the food buff, but since you can’t be one you won’t get it. Sorry. 😉 Doesn’t mean you can’t eat that yummy Pandaran cooking for that 300 Int, though. All food buffs last one hour. Are you working on your Demonology Warlock to reach the end-game raids? Already there and leveling another class/spec? Need yet another 100 in your group? With thousands of quests and a few bazillion mobs to grind the trip to top level can take a while. A long while, even if you’re done it before. 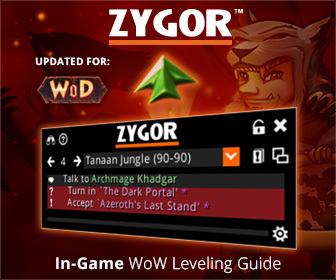 There’s an easy solution which will speed up your leveling, by a lot: an in-game leveling guide, Zygor’s Guide, almost automates the whole leveling path for your ‘lock, regardless of which level you start from. You still have to play the game, of course, but the “where to go and what to do” part is neatly taken care of. You’ll never wonder what to do next, which makes the trip to 100 a whole lot easier. Zygor’s is always quickly updated for all patches and expansions and includes some nifty extras, such as an in-game talent adviser and more. Grab your copy here and get leveled fast, or read our Zygor review first. This was Very helpful as I always feel like im doing things right with my loc. Only thing I don’t agree or understand is why pick the felguard? Ever since they changed things mine dies ALL the time I always use the void to tank he rarely needs healing and I can just focus on casting. Am I wrong in this or doing something wrong? Well, if the Void works better for you than the Fel, then use it. 🙂 You also have to remember that the page is aimed at Warlocks in instances and raids, though I guess it doesn’t actually SAY that on the page. The Fel is a better DPS (damage) critter, and the tank should be taking the aggro. The Void is a better tank, so if you’re leveling or questing (or dailies) then that Void might be the better choice. What’s the best way to get my hit up to 15%? I’m only a little over 8% right now. If a piece of gear has no Hit, reforge the weakest stat to Hit. If it does have hit, then reforge the other stat to Expertise. You can gem and enchant for Hit. If you’re human or gnome then your racial will add 1% to your Spell Hit, if you equip a sword. What if when you go into demon form your corruption doesen’t change into doom? Interesting question. Let me look around more, but right now I’m going to say it’s a bug. It should become Doom when you go Demon. Can you repeat the error? This has been a very helpful website. Simple and straight forward. This will help my warlock a great deal. Thank you.